Website visitor Wells S. wrote to ask that I post this article covering the RC Scale event for the 1974 AMA Nationals. He was particularly interested in the appearance of Top Flite's P-47 Thunderbolt (aka "Jug"). The November 1974 edition of American Aircraft Modeler covered the entire Nats meeting at Lake Charles, Louisiana, including RC Pattern, RC Pylon racing, RC Scale, CL Scale, CL Stunt, Free Flight, Indoor, and Helicopter. The articles for all categories will eventually be posted here. Let me know if you want any one before I get around to adding them all. Any doubt remaining that Sport Scale was destined to be anything but popular was erased by the first running of the event at the NATS. The 20-entry field was a multi-colored mixture of many different types, competently flown. The top ten aircraft in the final results were: FW-190, P-47, Acro-Star, Pitts Special, P-38, Beech Bonanza, Stormovik, PT-17, P-40 and PT-19. Claims have been made that the rules favor or discriminate against one type of aircraft or another. This list indicates that one of the most important requirements for continuing success of a Scale contest has been met; an opportunity for any kind of prototype to be selected and have a chance of being competitive. A lot of fliers have been promoting changes in the rules to call for automatic maximum scoring for scale operations like retracting gear. The one-two placing of retract gear types doesn't support any arguments that they are at much of a disadvantage when judged under the present "according to scale-like qualities" outlook. It must be remembered that these mechanical gimmicks are being flown against airplanes which can't be equipped with them and are doing maneuvers instead. If it is fair for a Spitfire to get full points for getting up its gear, why isn't it fair for a Great Lakes to receive maximum points for doing a loop? And by the way, why does a P-51 get to fly around with an unretracted tail wheel, when anyone who tried that with a P-39 nose wheel would get zonked? Bob Wischer really has it all together this season. Fresh from a triumphant victory at the '74 AerOlympics, he and his Emeraude captured the NATS Class II Crown. Among the contestants were long-time "super-scale" types like Maxey Hester, Bud Atkinson, Dave Platt and Bob Underwood. Most of the rest were new to NATS Scale competition, evidently drawn by : the Stand-Off Scale emphasis on scale appearance without measuring and nit-picking. A good trend is the appearance of top caliber Pattern fliers like Don Coleman and Jerry Nelson (third and fourth). The combination of realism and good flying promises a good future and made for an interest­ing, crowd-pleasing affair. A sort of "battle of the kit prototypes" went on as one feature. 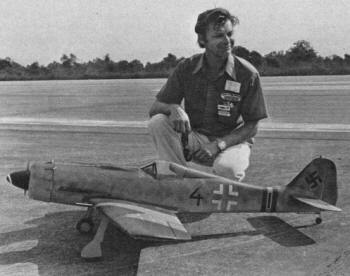 Dave Platt, one of the originators of the Stand-Off concept, had his new FW-190 doing smooth and precise patterns that spoke of good basic design. Dan Santich, who had taken over as Top Flite's designer when Dave left, was close on his heels with their new P-47, also a sharp-looking, clean-flying model. At one time in the final round both planes were in the air at the same time, their flight patterns overlapping in the middle of the area. You almost expected a dogfight to break out, complete with rat-a-tat-tat sound effects. In this particular matching, Dave's higher scale score helped him reverse the results of World War II and the Fockewulf came in first, Santich placing second. We'd like to be able to give you a scoop on when these new ships will be in the box and available but, considering the supply situation for kit makers, no one wanted to go out on a limb and name a date. 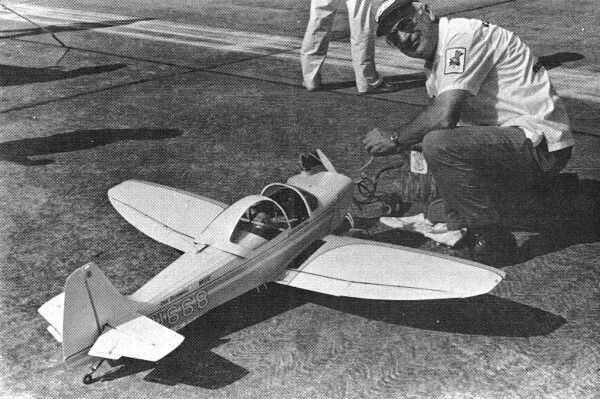 Jerry Nelson's fourth-place Pitts showed fine aerobatic ability and the classic chunky appearance of its prototype. Designed for his new, proposed biplane stunt event, it is scheduled to appear soon as a Midwest kit. Pleased as punch! Dan McCan of Pylon fame took top honors in Class I Scale with his Shrike. Good 'ole Platt is back. In true form, Dave took first place in Stand-Off Scale. Shades of Bob Hoover! Soon to be kitted, McCan's Aero-Commander is one lover of a scale machine. No matter what your drinking habits, you'll be able to get a Jug soon from Top Flite. Dan Santich flew the prototype to second place in Stand-Off Scale. 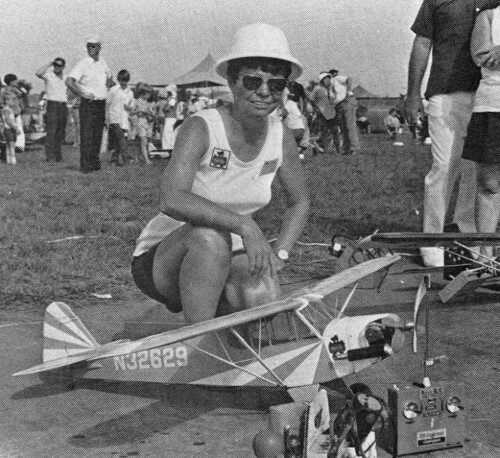 A true champion, Hazel Sig was the first lady to fly in the NATS Scale event. Of course, she flew Sig's ever-popular Clipped-wing Cub. For the first time in a number of years, Scale was graced by a lady flier, Hazel Sigafoose, who flew the Sig model of the full-size Clipped Wing Cub that she also pilots. Hazel had fun and a good-natured line, "I placed fourth ... from the bottom!" Multi-engine fans were entertained by Joe Alexander's fifth-place P-38 and J. Bunzi's Douglas DC-3. The Lockheed looked great streaking back and forth, and on close examination proved to have many detailing features that would have done credit to an AMA Scale entry - those fine special tires, for openers. The DC-3 flew a bit fast for the appearance of scale speed, but it seemed to handle well; though the last landing bumped a lot and sandpapered some of the nose off on the runway. Evans' huge J-2 Cub cruised around easily, proving once again that a large model is not necessarily dangerous. Sid Axelrod must have had to increase production of Mono-Kote when this behemoth was covered. A rules proposal was due to be made before the Sept. 1 cutoff date that Sport Scale be advanced from a provisional to an official event. The Nationals experience indicates that this move will have considerable support. 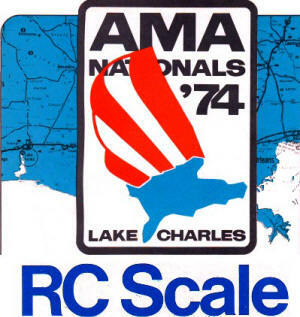 The severe decline in AMA RC Scale entries brought comment that, as had been predicted, the event would be wiped out by the rise in popularity of Sport Scale. There may be a grain of truth here, but there are more logical reasons. Just the overall decline in Nationals contestants compared to previous years accounts for some reduction, plus the fact that several probable entrants burned up their vacation time at the Scale World Championships as contestants or spectators. Considering that the total number of RC Scale airplanes present in the three events was 31, the net result is actually a good percentage increase in RC Scale interest on the total NATS contestant base. Far from being a hindrance, my feeling is that the group of new fliers in Sport Scale is going to be producing a number of scale nuts who will want to move up to the challenge of super-detailing called for in AMA Scale. Splitting the entries into Class I (Novice) and Class II (Expert) brought some criticism. In the first year of operation the rule (three points for first, two for second and one for third, multiplied by the number of contestants until you reach 100 points and become a Class II Expert) for all practical purposes, made a Novice of everyone who wanted to be. You can declare yourself an Expert, but then you must remain one. Originally, five of the 11 AMA scalers were so entered. Before flying, two reconsidered the finality of the action and flew as Novices. There will be a little confusion initially, but this basic system of advancement has had a good record in RC Pattern events. It has brought new competition fliers to the ranks by giving them a chance to get started without having to go head-to-head with Experts. Originally scheduled for Wednesday and Thursday, Aug. 14-15, it appeared that radio time could be found on Sunday afternoon for AMA Scale after Sport Scale, because of the smaller number of entries flying. This rescheduling had the advantage of allowing judges and scale officials, as well as the AMA Scale contestants, the choice of going home four days early - but it took some searching to locate everyone and tell them of the change in plans. A few contestants who were flying sport Scale, also, or had minor work to do on their planes to prepare them for flying, were put under pressure by the change. Consequently, there was some restlessness among the natives. In the end, the last-minute switch came off without too much dislocation. Sport Scale had four rounds (where the rule book only calls for three) causing one contestant to complain about having to fly so much in the heat. Besides, you were supposed to be consistent and not need a large number of flights to get a good one. Maybe, but it's kind of nice to get just one more try at the brass ring. AMA Scale traditionally has been flown on the basis of as many rounds as there are time for, and six were squeezed into the time allotment. Dan McCan topped the Class I results with his glittering Aero-Commander Shrike, a beauty that took two years to complete, including making the fiberglass fuselage plug. He will be taking the Testor's Best Finish Award back to California with him, too, if he can find room for the big packing crate required to transport it. 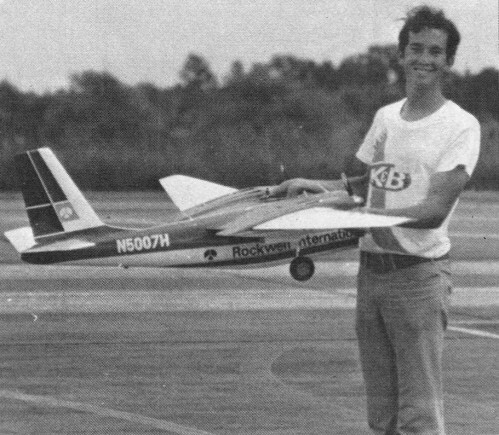 Larry Smith came in second with a smooth Zlin Akrobat, though on the last flight something put it down hard out in the boondocks on the other side of the runway. 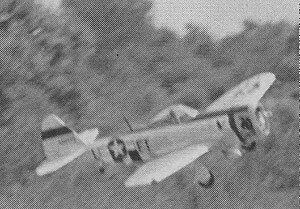 Ray Coletti's Fokker D-7 was third, Ralph White's P-51 fourth, and Don Neil fifth with an F6-F. Bob Underwood had the rare twin-engined Lockheed Alcor, equipped with a 900 rotation rearward (P-40 style) modification to the Rom-Air units. It flew well, but was damaged after several flights when it snapped on a takeoff. World RC Scale Champion Bob Wischer wasted no time going to the top of the results board in Class II and staying there, proving beyond question that 1974 is his year. Charlie Viosca placed third with his Sig kit box label. Cub J-3. My Shinn 2150 placed second, but the name that should be on the trophy is Jim Grier. Laid low by a collection of pilot and airplane ills, I had thrown in the towel and was not going to fly. He found and cured the model troubles, revived the pilot in his air conditioned motor home, and then ramrodded us to the flight line and through the last two rounds. It is the sportsmanship and friendliness of guys like Jim who make this the great hobby it is. While on the subject of assistance, many thanks to Tom Stark, Mike Stott and Bob Wischer, for taking pictures when I couldn't hack it; and to Larry Jensen and the many others who lent a hand along the way.